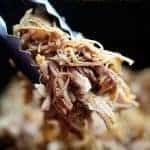 Low carb pulled pork in the crockpot! This simple recipe is perfectly seasoned and cooks with a can of beer in the slow cooker. I mentioned a few days ago that my husband bought me a smoker for my birthday this year. And here I am…showing you how to make pulled pork in a crockpot. Ha! It’s just two things – 1. I’m not sure how many of you actually have a smoker and would want a recipe for that (tell me if you do!) and 2. crockpot pulled pork is actually super delicious and so dang easy. So today you get this keto pulled pork in the slow cooker! Lucky you! Obviously, traditional sandwich buns are out for serving this pork if you’re low carb, so get creative! 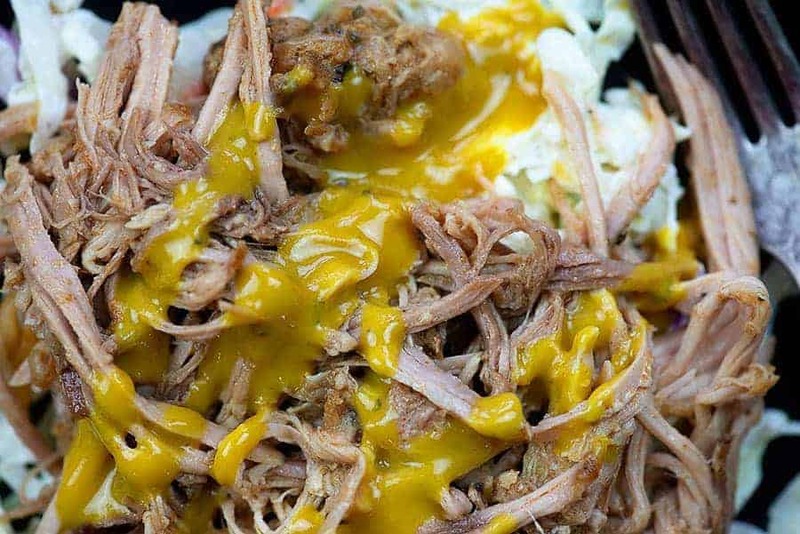 We often eat this beer pulled pork over a pile of my keto coleslaw. It’s also good on salad with ranch dressing or fathead pizza. In the past, I’ve also made BBQ pulled pork and used a rub full of sugar to coat the pork. Not anymore! The seasoning for this pulled pork is seriously SO good and it’s so much more versatile because it’s not sweet. You can add your favorite sauce if you want to sweeten things up or you can use the pork in other ways. 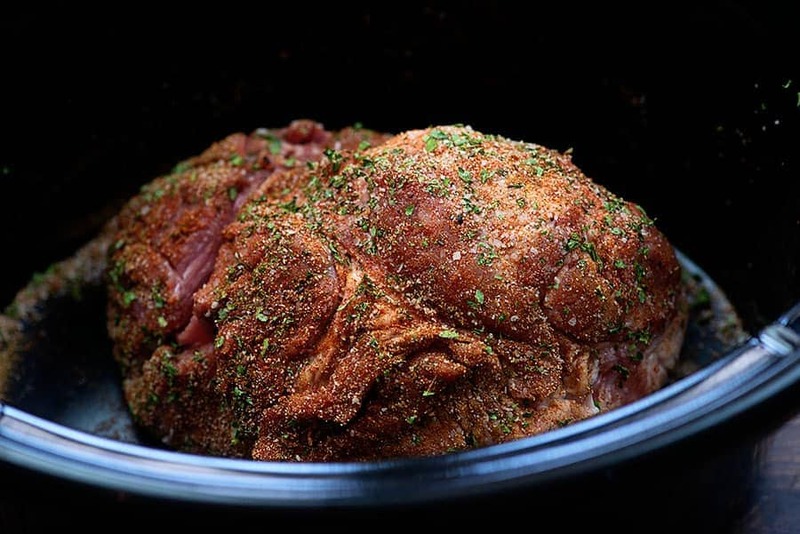 Start by placing your boneless pork shoulder in a crockpot. Stir together some cumin, garlic powder, onion powder, salt, parsley, and paprika and rub it all over the pork to coat. 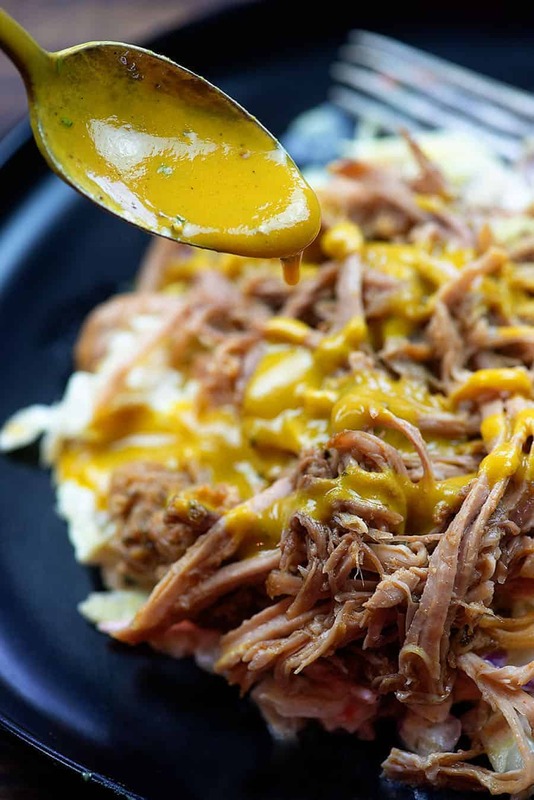 Pour your favorite low carb beer into the bottom of the slow cooker. This doesn’t have a strong beer flavor at all, but feel free to use chicken broth if you prefer. Cover the slow cooker and cook on high for 4 hours or low for 8 hours. The meat is done when it easily shreds apart with a fork. Shred the meat and stir it around in the juices in the bottom of the slow cooker before serving. 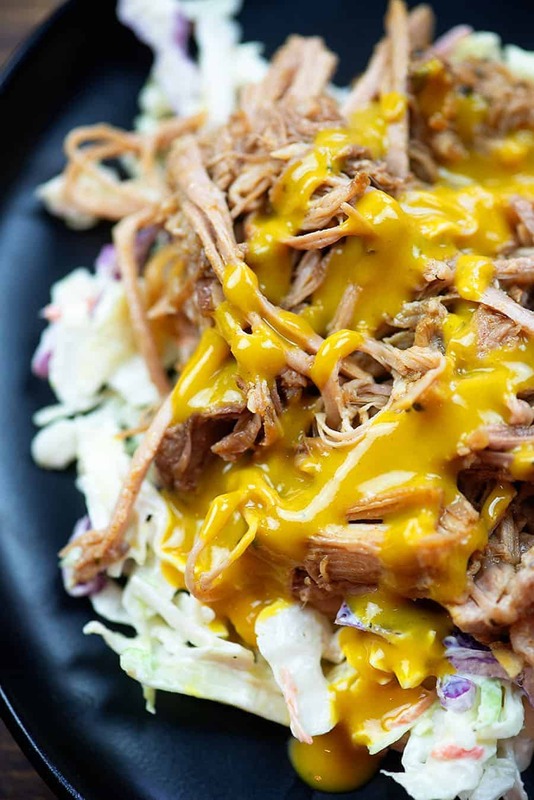 We like this pulled pork topped with my mustard BBQ sauce. Seriously, this keto pulled pork is a total favorite in my house. It’s seasoned really well and the tangy mustard BBQ sauce works perfectly with the richness of the pork. 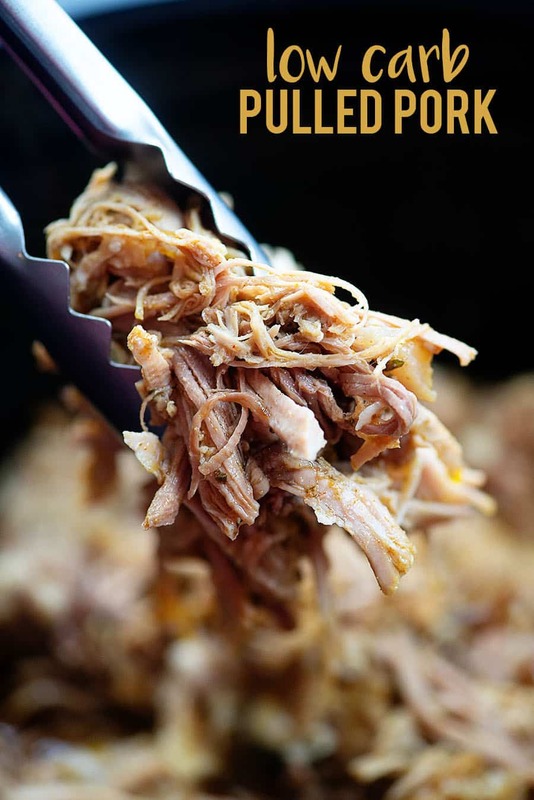 If you haven’t made pulled pork in the crockpot before, you need to give it a try! Hasselback Chicken Fajitas: You won’t even miss the tortillas. BBQ Meatball Recipe: Hello, football food! Frittata Muffins: I eat these warm or cold for breakfast and snacks! Tender, juicy pulled pork made in the slow cooker! The seasoning is so good, but feel free to swap in chicken broth for the beer if you prefer. Add the pork shoulder to a large slow cooker. In a small bowl, stir together the parsley, cumin, garlic powder, onion powder, salt, and paprika. Rub mixture into the pork being sure to coat all sides. Pour the beer into the bottom of the slow cooker. Cover slow cooker and cook on low for 8 hours or high for 4 hours. Pork is ready when it easily shreds with a fork. Shred the pork and stir the meat into the juices in the bottom of the slow cooker. Serve immediately or keep warm in the slow cooker until ready to eat. Serve this topped with my low carb mustard BBQ sauce! Looks delicious! Would love some smoker recipes. I got one last year and have been too intimidated to try much! I think this blend would work well in a smoker. You could add in some sweetener if you wanted more of a bbq flavor. I am not a beer drinker, so I have no clue what kind to use. Also, do you have any idea if gluten free beer would work? I am sensitive to gluten. Thank you! Hi , my pork still has the skin on – should I leave it on or should I remove it before cooking ? how much (ounces) is the serving size? I saw you could use chicken broth… would beef broth be a good alternative instead of the beer? I made this yesterday, with the beer, Bud Light, and it was so good! I just need to make some coleslaw with it to really kick it up. I didn’t add any sauce to it either. It would good coming straight out the broth made. I tried this out but my meat never turned into shredded, it just stayed like a roast my grandma says I should have done low heat for a long time instead of high heat for 4 hours. Thoughts? It just needed to cook longer. Every slow cooker is different, unfortunately. Some run hotter/cooler than others. If it wasn’t shredding after 4 hours, it needed a bit more time. I bought a bone-in pork shoulder… Not realizing the recipe called for boneless. How should I adjust? Yes please can I have a smoker recipe!! This would be amazing in a smoker! I wonder how this would do in an Insta pot? And how long on what setting??? I would cut the pork into 4 big chunks and cook for 40 minutes with a natural pressure release. The rub was very similar to the one I normally use. Didn’t have low carb beer so I used 3/4 cup chicken stock and 1/4 cup peach brandy. Also added 1/4 cup peach brandy to the mustard bbq sauce. Absolutely loved it! So much tastier than regular bbq sauce. Served it with the coleslaw recipe which I also loved. Definitely a keeper!